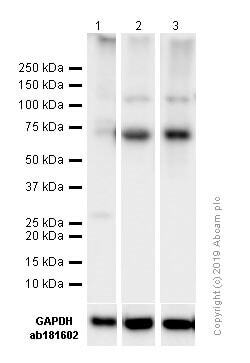 In regards to the IF staining with this antibody: can you please let us know if the Hela cells were treated and if yes, how, for having this nice staining? Also,have you observed under some conditions an all nuclear staining? Can you please also let me know how the cells were fixed and permeabilized to observe the protein in immunocytochemistry? Thank you very much! For HeLa cells, fix and permeabilize with acetone at -20°C for 5 minutes. This treatment results in high quality immunofluorescence images. It is not necessary to permeablize with 0.1% Triton-X100. Mainly nuclear staining is observed. NF-kappaB is also found in the cytoplasm in an inactive form complexed to an inhibitor, I-kappa-B.